When a forum member posts a positive experience with a dealer, mentions that dealer by name on the forum, obviously that is a big plus for good dealers. I'm sure you would get no threatening legal letters from their lawyers! It's also a big plus for forum members coming to the forum because they see personal recommendations of good dealers they should visit. Perhaps we could also post negative experiences, but just not mention the dealer by name? Should someone want to alert a poster, about a less than reputable dealer, it could be done via email or a private message. The absense of good recommendations for some dealers would be one way of stating the obvious. Not a perfect solution, but perhaps it would prevent Frank's threatening lawyer letters. Frank, I do think a good disclaimer is a good idea. It was obvious that the poster baited for replys. Keep the Forum as it is now because I hear and see many people who say that they have benefited from reading through here. If an opinion of a brand is requested, any person should be able to give their own impressions on the instrument as well as how it was presented, tuned, prepped, priced, delivered, ect. This will involve the dealer regardless if the decision is made to curb any postings about them. Frank, let me know if you need my help. Just for some humor, A lawyer for this unmentioned dealer bought a grand from us. I just saw your edit. It sounds like we are thinking along the same lines. And you know what that means, don't you? I suggest we thwart our adversary by speaking in secret code. Henceforth, let's refer to smoking this dealer out of his hole by posting the e-mail here as the "Roach Approach." Frank, If their legal approach is already in the wrong, what makes you certain changing things will have an effect? That's the nature of being frivolous. If, in any other way, relative distinctions are made about dealers, some will be still left behind who may sue, or do whatever $125 buys them. I'd just ignore the email and suggest we don't change a thing. It was probably all dressed up and formal, with a letter head....yada, yada. Your first post suggests you already know you are right and nobody here feels any differently about that. So, why accomodate? You could also economically craft up a response email using the discovery that your previous experience generated, forward it to your lawyer and have them send it on all fancy like. How much could that cost since you've already demonstrated that you obtained representation under a similar circumstance? I do take it your lawyer will remember you? Whatever you do, it seems pretty clear the opposing side is taking the longshot you'll fold. On the off chance litigation takes place, you can count me in for help. I'll send a check too! PW has enriched my life. I might as well pay to defend it. I am going for all out on this. There are perhaps dozens of company lawers here clenching their teeth [secretly] for battle. But they are too smart for actually going ahead. To be seen as loosers before a world wide audience. Go,stick the papers on the doors of Wittenberg! Call the e-mail tigers on the floor!! The pertinent laws which protect this board and participants are called anti-SLAPP laws. Here's a website that deals with the subject: The California Anti-SLAPP Project. Although it deals specifically with California law, there is information about other states. A search of the web will no doubt turn up other information. 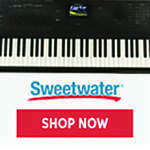 My opinion: All of us know that PianoWorld.com provides an extremely valuable service to people seeking to purchase & maintain a very expensive consumer product. 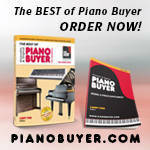 There is no place, other than PianoWorld.com, where Joe Consumer can get honest, frank advice concerning these subjects ("The Piano Book" is a good resource but it doesn't cover everything). These types of discussion should be welcomed & encouraged. Piano owners also appreciate the other discussions provided by fellow students, technicians, teachers, musicians, & lovers of keyboards in general. I sense that the potentially litigious scenarios usually arise when a legitimate NEW poster (consumer) starts asking for advice re ABC Piano Weasles Co., whether he is considering a purchase, or has made that purchase. I believe these posters (consumers) expect & should receive honest opinions from members of this forum. Therefore, I think it is very important for all NEW & existing posters to be made aware of the following, e.g. : "What you post is your opinion only & may be subject to possible litigation. Be truthful, polite & respectful. Don't slander others. Our success is due to the efforts of our individual members, blah, blah....". Of course, those who "troll" or "bait" members on this forum for negative dealer comments should be banned ..... And I think the senior PW folk are quite on top of this. (As an aside, I'll state that when I bought one of my new pianos & spoke about it on PW, I was "baited" through a PM, by a dealer for "my experiences" concerning other dealers .... so members should look out for this too). Frank, if you can PM me with your name/address/zip code ..... I'll send you a U.S. money order & a smile . Changing things in response to frivolous demands amounts to appeasement. This begets more of the same. I urge Frank to not give in to this sort of thing. Perhaps we could also post negative experiences, but just not mention the dealer by name? What would be the consequence of posting "I had a fairly lukewarm experience with a dealer in East Overshoe, Minnesota who caries a Japanese brand that starts with 'K' and an Austrian brand that starts with 'B'..."
I'm also surprised that PF hasn't gotten a similar letter from a laywer representing the entire piano industry in an Asian country that starts with 'C'. Just curious: did the letter also demand that Frank provide details of the offending poster's IP address, so they can sue said person's ISP as well? That's the direction the anti-spam laws seem to be going. Chris raises a good point. Even if the forum self-polices itself, since anyone can write a threatening letter, who says self-regulating will satisfy every grubby dealer? What about piano brands? If I say "Faziolis are lousy. My Brand X upright is better. 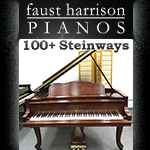 Don't buy Faziolis," can Fazioli send a "stop it" letter to PW? How can the forum function then? I think Jack Frost (esquire) is chiming in with the angles that are most pertinent. Fortunately or unfortunately, a lawyer's input is probably most important here. Any concessions of format, such as using star rating systems in lieu of actual verbage, will mean that this dealer has unilaterally, and possibly without contention, tailored a very large playing field to suit only themselves. The Piano Forum, for those of you that find it valuable as it is, would be forever changed...and vulnerable to other non-approving retailers. As it stands, no concessions have been made and the Piano Forum, I suppose, stands strongly and states that it has law on its side. When that is no longer the case, and I do sympathize with your dilemma, Frank, the Piano Forum may become more of a 'target' for the disgruntled. I do, however, think you are on the right track when you mention properly disclaiming the forum and the posts. I think that is a good way to go, and possibly, if I understand Jack Frost, a way to cement your legal argument...which seems sound anyway. I can not decide financial issues for you. I can, personally, only say that it would be 'nice' if the Forum changed its format due to more than a "shot across the bow" email. Rather, I submit that they don't want to pay lawyers' fees any more than you do. They have written this email to you out of a 'fear' response. Fear of losing business, etc. If properly combatted, they may realize they should put their energies into improving their reputation rather than spend $ on lawyers. This isn't your concern, though, really. Rather, you need to do the thing that you can afford and that will allow you to sleep well at night. so I can send you a check? Thanks a bunch - for hosting this great place, and for putting up with all of us. Jodi - Thanks for link. I've bought lots of stuff from SheetMusic, but not as a hyperlink from PW. All future purchase will be from that link. With our freedoms seemingly being gradually eroded in this country, this PW issue might be one place where we can clearly make a stand. If PW ignores this and future similar threats from dealers' lawyers, and the unlikely happens and there is litigation: it would be one dealer paying his attorney's fees, versus ***ALL*** of us who choose to contribute $$ to PW's legal fees. Sounds like we would be in a very good position, doesn't it?. The dealer loses a lot of $ whereas many of us lose insignificant amounts. If the dealer were informed of this, it might curtail his litigious inclinations. For instance, if 50 of us tossed in $20 that's a grand right there, and I know from last year's discussions about the NY dealer that many posters said they'd contribute much more (and count me in as a contributor). Perhaps a hard list can be made of definite contributors and amounts, should a lawsuit occur or substantial attorneys fees be involved -- would such a list make Frank breathe easier about (a) ignoring such dealers' attorneys' letters; and/or (b) taking more overt actions such as posting such letters? Frank, three or four others have said they would like to send $ but NOT via PayPal, but via regular mail. I also am in this category, so pls send me your smail mail address and the payee's exact name if possible. I vote to keep the forum as it is, and without any sort of "star" rating system. Let viewers interpret positive and negative verbal feedback as they wish. IMHO that's preferable to superimposing an artificial (and probably statistically imprecise or even incorrect) rating system. Statistics theory likes very much to have at least 30 data points, and I doubt we'd get anywhere near that for feedback on most dealers. So why try to sqeeze what is really anecdotal evidence into a statistical rating system? 1. There are way too many lawyers. 2. It doesn't cost an agressive competitor much to turn and aggressive but ethically challenged laywer loose with claims of defamation/libel. 3. Most allegations of defamation/libel are made for purposes of chilling the competition, nothing more. 4. The practicalities of taking a libel/defamation case to trial are considerable...not the least of which is proof of damages. How is your hypothetically injured dealer going to prove to a jury that his business has been damaged by this forum? 5. Given the practicalities/difficulties with libel and slander cases, 99% of the demand letters that go out are not precursors of litigation. They are intended to (i) chill the market from saying anything contrarty to the letter writer's interests and (ii) cause the recipient to spend money on lawyers. Judging from this thread, your angry dealer has achieved what he intended to achieve. Oh yes, and I just wanted to add my vote to not change a thing about this place. Adding some sort of dealer rating system would just open a whole 'nuther can of worms. It's just not necessary.